Compare to M17T, M24T serial offer a more large display and more expand capabilities, they could be installed extend ATX motherboard,8~20 hard drive, up to 7 full-length add on cards. It is designed a powerful removable system for field applications. Put it at the heart of your high-performance portable computer solutions. This portable computer chassis allows you to combine the latest in high-performance motherboards and add-in special function boards with a large display into a system that is compact and extremely rugged. It offers a cost effective solution to performance demanding portable computing applications. The Mil-M24T is able to house a maximum of seven expansion cards (motherboard dependent) along with 6x 3.5” removable drive bay, 1x slim DVD bay and 2x 3.5″ internal hard disk drives, optional 16x 2.5″ removable hard disk drives, offering expansion capability unmatched by any other portable system. The Military standard Rugged Portable M24T serial at the ideal solution for applications such as remote flight control and simulation, on-site HD video editing and broadcasting, network/communications testing, field data acquisition, remote field service, exploration, factory monitoring/automation, new technology demonstration, and much more. 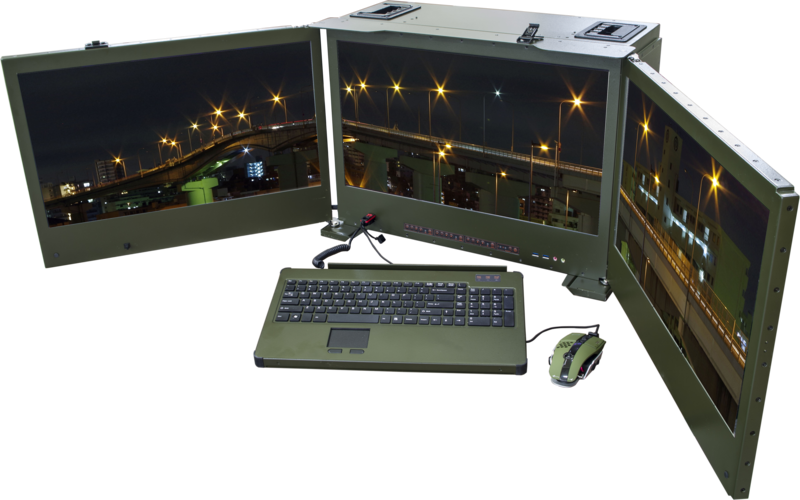 Mil-M24T has three24″ widescreen LCDs built in it to provide you with large display area with crystal clear details. The screens fold nicely into the reinforced enclosure providing unsurpassed portability and durability no matter where you are. M24T has a double card retention system that holds individual add-on cards securely at two points with an adjustable pressure mechanism ensuring that half and full-length cards are secure during transportation. Previous models of our trans-portable computers required special custom shape power supplies. With theMil- M24T, any standard desktop power supply is compatible so you have the freedom to choose the right power supply to meet your specific needs.